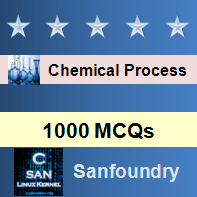 This set of Chemical Process Calculation Multiple Choice Questions & Answers (MCQs) focuses on “Energy Balances without Reaction”. Explanation: The Conservation of Energy states that the energy of a system plus surrounding can neither be created nor destroyed. Explanation: U+25B3E = U+25B3(U + PE + KE). Explanation: U+25B3E = W + Q. Explanation: For a steady state closed system, U+25B3E = 0. Explanation: For a steady state closed system, U+25B3U = 0. Explanation: For an open system, U+25B3E = Q + W – U+25B3(H + KE + PE). Explanation: Evaporator that concentrates a solute is Open, steady state process. Explanation: Turbine is Open, steady state process. Explanation: Batch Distillation is Open, unsteady state process.